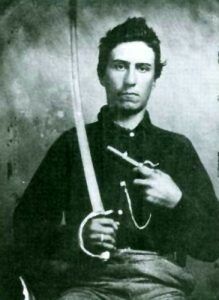 John Wilson Vermillion would grow up to become one of the many gunfighters in the Old West, with colorful nicknames like “Texas Jack” and “Shoot-Your-Eye-Out” Vermillion. He is most well known for his participation with Wyatt Earp in the Earp Vendetta Ride after the Clantons had killed Morgan Earp in 1882. Vermillion was born in Russell County, Virginia in 1842, the second of 12 children born to William and Nancy Owens Vermillion. When he grew up, he served as a Confederate soldier under the command of General J.E.B. Stuart during the Civil War. When the war was over, Vermillion went to Indiana where he married Margaret Horton in September, 1865. The pair soon moved to Missouri where Jack worked as a Territorial Marshal for the eastern section of Missouri. He and Margaret had two children, a daughter named Mary, and soon, a son. However, just a few weeks after his son’s birth, Vermillion was traveling when a diphtheria epidemic broke out in eastern Missouri. Unfortunately, by the time Jack returned home, his wife and both of his children had succumbed to the disease. Grief stricken, Vermillion headed westward and by the late 1870’s he was in Dodge City, Kansas where he was known to have drank heavily, gambled often, and gained a reputation as a gunfighter. There he made the acquaintance of Virgil Earp, Wyatt Earp, and Doc Holliday. A couple of years later, he was in Tombstone, Arizona, working as a special policeman for Virgil Earp in 1881. After the Gunfight at the O.K. Corral in October, 1881, and Morgan’s murder in March, 1882, Wyatt and Warren Earp, along with Doc Holliday, escorted the Earp family out of town before going on the well-known Earp Vendetta Ride, of which Vermillion was a part. The next year, Luke Short, who was in Dodge City, Kansas and in a feud with other business men there, called upon Bat Masterson for help. Bat rounded up several gunfighters including Wyatt Earp and Jack Vermillion in what is known as the Dodge City War. Though the “war” never actually wound up violent, it threatened to be as some of the Old West’s best known gunfighters lined up in support of Short. While Vermillion was in Dodge City, he shot and killed a gambler who was cheating at cards, after which he appeared on a wanted poster as “Texas Jack Vermillion.” Where the “Texas” part came in is unknown. According to one tale, when Vermillion was asked why he was called Texas Jack, he replied “Because I’m from Virginia.” Later, he also became known as “Shoot-Your-Eye-Out” Vermillion, allegedly because he had shot the man in the eye. Soon, Vermillion was back in his home state of Virginia, where he married a woman named Nannie Fleenor in 1883 and had two children. However, history finds him back in the west by 1888, where he joined up with Soapy Smith and his gang of con artists in 1888 in Denver, Colorado. In August, 1889, he was with Soapy, Bascomb Smith, and “Fatty Gray” Morris at the Pocatello, Idaho. There, a rival bunco gang tried to assassinate Soapy and a shootout occurred at the train depot. Soon afterwards, he left the gang and once again returned to Virginia, where he died peacefully in his sleep in 1911.